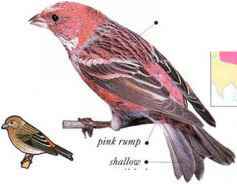 A large finch with two wing bars, this bird has a capacious bill adapted for eating buds. Other foods include seeds, flowers, insects, and berries. 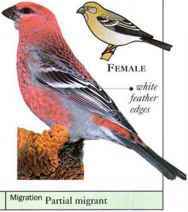 It lives in pairs when breeding, and flocks roam about in search of food during the winter. • NEST A cup nest of twigs, moss, and heather, lined and placed high in a conifer. • Distribution Northern forest /.one of North America, Europe, and Siberia. Some birds move south within distribution LZZ!>this range in winter. 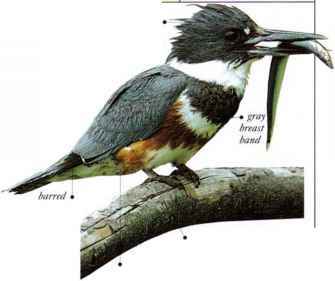 Having learned to exploit human dwellings as a source of food and nest sites, this species is common in villages and suburbs. Winter (locks feed on seeds and orchard fruit. • NEST A cup nest of grasses and other soft materials, in a bush or on a post or building. 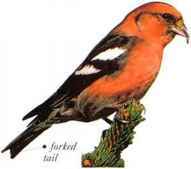 A ground-feeding finch of northern coniferous forests, this bird is partly nomadic, moving about in search of suitable conditions for breeding. 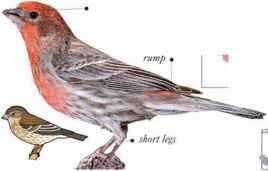 In winter it forms small flocks that travel about, feeding on seeds and sometimes on insects.